ABC News has called Pennsylvania for Obama. Added: CNN has also. McCain can't win without Pennsylvania. He pinned all his hopes on it. I think it's over. 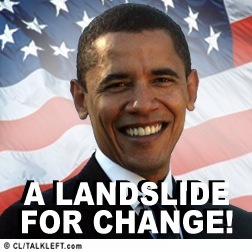 The Obama campaign is saying it's too early to say Obama has won, but I think it's going to be a landslide. A new Rasmussen Pennsylvania poll finds Hillary Clinton still more likely than Barack Obama to beat John McCain in in November. The latest Rasmussen Reports telephone survey in Pennsylvania finds McCain with a statistically insignificant 44% to 43% advantage over Obama. Clinton attracts 47% of the vote against McCain while the Republican earns 42%. Two weeks ago, in Pennsylvania, Hillary Clinton enjoyed a nine-point lead over McCain and Barack Obama had an eight-point edge over the Republican hopeful. Now, however, Clinton’s lead is down to five points and Obama trails McCain by a point. ....Clinton is currently supported by 78% of Democrats, Obama by 65%. Among unaffiliated voters in the state, McCain leads Clinton by twelve and Obama by five. Hillary Clinton is about to speak at a rally in Philadelphia. I'll be live-blogging here. Ed Rendell is warming up the crowd. Mayor Nutter is speaking. Time for the introduction. Here she comes. She's in green. She hugs the Mayor of Philly. She's jubilant. Bill and Chelsea and her mother are there too. Bill is behind her as she begins to speak. Hillary: Thank you very much. Oh, thank you. It's a long road to 1600 Penn. Ave and it runs right through the heart of PA. For six weeks Obama and I have criss-crossed the state making our best case. You listened and today you chose. Time for a third results live blog. It's below the fold and will start momentarily. New live thread here. This one's closing. Fox and NBC call Pennsylvania for Hillary Clinton. Our first live blog is filled with comments. We're starting our second, it's below the fold so that it can be a bit wider than the front page allows. Just click on the "There's More" button or bookmark the permalink to go directly to it. If you experience scrolling issues, toggle the scroll button at the bottom of your screen. Comment as with any other thread, in the space below. Big Tent Democrat and I will live blog the election results. We'll begin when the polls close and start new threads when comments reach 200 or so. Barack Obama isn't sticking around Pennsylvania to get the results. He's headed to a rally in Indiana. John Mellecamp will perform at the Obama rally, but CNN says he's not endorsing Obama and will perform at a rally for both candidates in a few weeks. Hillary is staying in Pennsylvania tonight and will hold a rally at a hotel in Philadelphia. CBS has posted its exit polling from Pennsylvania. The economy was the dominant issue by 2 to 1 over Iraq (54% to 28%).Only 14% chose health care. Change was more important to voters than experience by 49% to 26%. 54% said campaign ads that aired in the past week was important. 39% attend church weekly. 59% voted for Clinton. So, according to CNN, Obama didn't carry the gun or religious voters. CNN also says there are a lot of first time voters among those newly registered. Wolf Blitzer says this is a big deal. What's Considered a Win for Hillary in Pennsylvania? winning among rural, older, Catholic and women voters. Coming in second only or primarily among African American and younger voters. Howard Wolfson, Hillary Clinton's Communications Director, has a blog post up on Hillary's site called "Primary Eve." It's chock full of links to good reading refuting all the latest attacks on Hillary. In Case You Missed It: “Electability: Why Hillary Is More Likely to Beat McCain” Read more. Thanks, Howard! And yes, I hope everyone reads it. Hillary Clinton is the better candidate to beat John McCain this fall. Here is an Xcel spreadsheet from the PA Secretary of State showing the final tally of registered voters for the primary. Highlights: 4.2 million voters are registered to vote in the Democratic primary. Of those, 800,000 are in Philadelphia. 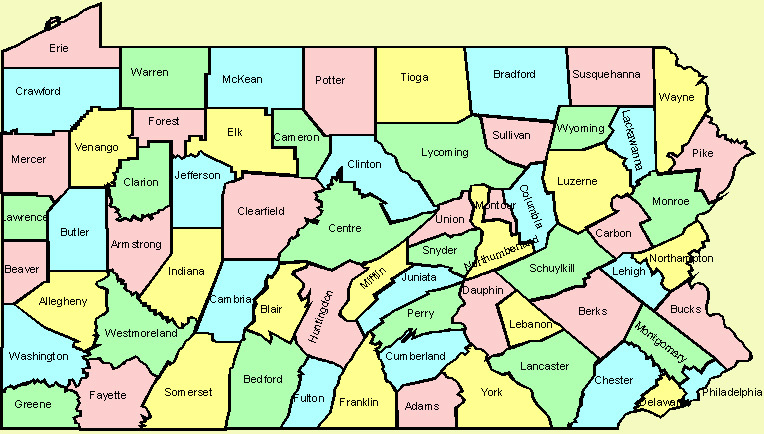 567,000 are in Allegheney (Pittsburgh.) The next biggest seem to be Delaware with 157,000, Bucks County with 185,000 and Montgomery with 248,000. By age, 401,000 (10%)are 18 to 25; 655,000 are 25 to 34; 709,000 are 35 to 44. 58% of registered Dems are over 45. 20% of registered Dems, are in the 45 to 54 age group. And 38% are over 55. As for new voter applications, they surged for the periods of March 24 and March 31, but dropped dramatically after that until voter registration closed April 22. In Philadelphia, 23,000 new voters registered during those weeks -- statewide almost 100,000 registered. About 100,000 voters changed party registrations during the three weeks of March 17, March 24 and March 31. Any number crunchers out there want to weigh in on what these numbers might mean for tomorrow's primary? Obama is airing an ad attacking Hillary's health care plan. Hillary now fires back. Here's the support for the statements in her ad. He couldn't answer tough questions in the debate. So Barack Obama is making false charges against Hillary's health care plan. Barack Obama is making false charges against Hillary's health care plan. Barack Obama is to mount the biggest advertising blitz of the presidential campaign this weekend ahead of Tuesday's Pennsylvania primary to try to force Hillary Clinton out of the race. ....Obama hopes to deliver a knock-out blow by outspending her in advertising. With tens of millions from fundraising at his disposal, he plans to spend well over $2m (£1m) on ads in the run-up to the primary, at least twice as much as the cash-strapped Clinton campaign. Obama has earmarked $465,000 for Philly alone in the final days to Hillary's $91,000. Obama's strategy, which he has deployed time and again during his political career, is that the more money spent on advertising, the higher the odds of winning an election. If you want to help Hillary out, go here. 100 Pennsylvania Mayors today endorsed HIllary Clinton for President. The 100 mayors endorsing Hillary today will work in the final week of the campaign to get out Hillary’s message of change for Pennsylvania and the country. Hillary understands the economic pressures of families who have lost jobs, face foreclosures, and can’t afford health insurance or college tuition. She understands what it’s like to roll up your sleeve and work hard. As president, Hillary will fight for the issues that matter to all Americans starting on day one in the White House. Add to that 11 Indiana Mayors who wrote a letter criticizing Obama's Bitter-Gate remarks. Barack Obama thought he was being funny with his comment about Hillary Clinton acting like Annie Oakley. Among voters from households where someone owns a gun, Clinton leads by seventeen points. Clinton leads among voters who say faith and religion are Somewhat or Very Important. Obama leads among those who say such topics are Not Very Important or Not at All Important.